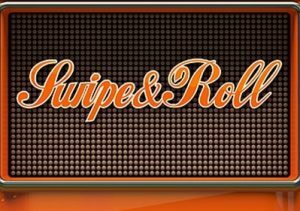 A swinging 60s-era casino is the setting for Swipe and Roll, a retro looking video slot from NetEnt. Played using a 5 reel, 20 payline game engine, it comes with multiplier wilds that treble payouts, respins with sticky wilds and a pair of wheel-style bonus rounds that pay up to 216 times your bet. Play on your desktop, tablet or mobile from between 20p and £100 per spin. The design in Swipe and Roll has an old school feel. The action takes place against a casino bar backdrop. The plain white reels have the look of a one-armed bandit and include A, K and Qs as well as plums and oranges. The top symbol is the melon which pays 15 times your bet if you land 5 on a payline. Wild Respins feature – landing 3 or more wilds on the same spin, either standard or 3x, will earn you a respin. On that spin, all of the wilds from the triggering spin are wild. If you have three 3x wilds, they will combine to give you a 27x multiplier! Coin Wheel feature – just like the prize wheel from the Price Is Right, this randomly triggered extra awards coin prizes. Land an arrow and it expands the win area, offering even more prizes. You’ll win between 5 and 54 times your bet in this round. If a Bonus lands on the wheel, you’ll automatically trigger the Bonus Game feature where even bigger prizes can be won. Bonus Game feature – as well as via the wheel, you can also trigger the Bonus Game feature by landing 3 scatters on reels 2, 3 and 4 on the same spin. The special new reels spin to reveal coin amounts or arrows. The arrows expand the win area which can reach up to 5 rows. Any amounts in the win area are then awarded. These can reach 216 times your total bet. The retro design, complemented by a swinging sixties soundtrack, works pretty well. That’s also true of the features which also have a slightly old school feel. There’s nothing particularly flashy on offer in Swipe and Roll. The wild spin and wheel bonuses offer some decent potential though. Old the theme here might be but Swipe and Roll offers a fresh take on the classic fruity theme. If you want something more modern, Blood Suckers II or Asgardian Stones (both by NetEnt) are suitable alternatives.